Twizics 2 identified air resistance as a major energy drain at high speed, but changing speed also uses energy. If there were no air, drive train or tyre drag, we could maintain a constant speed with little or no energy input, but accelerating and changing direction always takes energy. Acceleration increases kinetic energy, so you can work out how much energy you need for a given change of speed of a given mass. What’s not so easy to work out is how much we accelerate in the course of a given trip. Driving at high speed usually involves more acceleration and braking, but it’s hard to quantify. The lower your top speed, the less energy it takes to achieve it, and you also lose less energy when you brake. But should you accelerate gently to your top speed or is it best to accelerate hard? The energy to accelerate a given mass between two given speeds is the same no matter how long it takes you to do it. 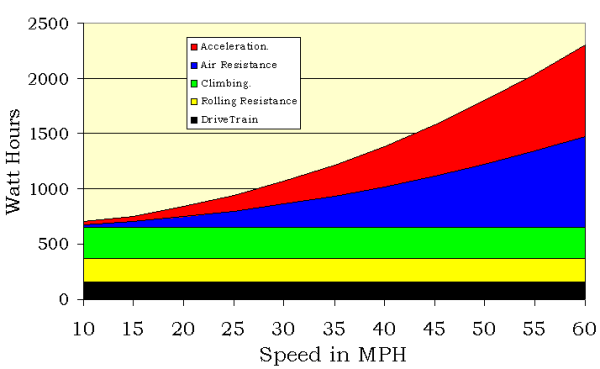 But the harder you accelerate, the higher your average speed will be over the course of your trip, and that increases the energy used to combat air resistance. So although you will spend less time combating that air resistance if you accelerate quickly, you will use proportionately more energy. So to maximise your range it is best to accelerate gently to your chosen speed and then try to maintain it. Braking reduces kinetic energy. In a Twizy you get some of this energy back if you slow down using the regenerative braking of the motor rather than the friction pads of the brakes. Friction just converts the kinetic energy into (wasted) heat, while regenerative braking converts some of it back into chemical energy in the battery. But unless we’re going to stay still, we have to accelerate and decelerate to get anywhere, and you can’t really work out theoretically how much energy you would use on an average trip. The other big consumer of energy around here is hill climbing. Once again, the physics is straightforward: it takes a given amount of energy to raise a given mass against the force of gravity, regardless of how long it takes. But again, the faster you climb the more energy you consume overcoming air resistance. Also, you will need more power even though you need it for less time, so if a hill is very steep, the Twizy’s motor may not be powerful enough to climb it at full speed. The bottom line is that it is difficult to predict how much energy a Twizy will use on a given trip unless you know the terrain and the speed at all points of the journey. In an attempt to construct an empirical model, I used a log of a trip I did last year in a fully instrumented electric vehicle. The log records the position (longitude, latitude and altitude) every 5 seconds of a vehicle being driven conservatively along a gently undulating 10 mile route at a maximum speed of 25mph and an average of 16. I did the same trip rather more quickly (maximum speed 35mph average 21) in a Twizy and I know how many Watt-hours of energy that took. Using this data set I can calculate the overall power consumption by applying the various parameters (drag coefficient, cross-sectional area, rolling resistance, drive train drag, vehicle and occupant mass, gradient). I do not know the true parameter values in all cases, so have made credible estimates. There are several combinations that will produce a “right” answer – i.e. one that corresponds to the actual recorded power consumption on this trip in a Twizy – but the tuning process enabled me to establish which ones are most sensitive. I then used this “model” to calculate the expected energy consumption for the same trip conducted at a range of “maximum” speeds. The graph below shows the (very simplified) result. Here’s (roughly) where I think the energy goes on a typical ten mile Twizy trip in gently undulating terrain in mid-Wales. This fits our actual consumption of about 125 Watt-hours per mile at the sedate speeds at which we drive, and the more exciting 170 to 190 Watt-hours per mile that we get when we’re showing off, and all our friends seem to get most of the time! This entry was posted in Technology and tagged air resistance, energy, kWh, Renault Twizy. Bookmark the permalink.